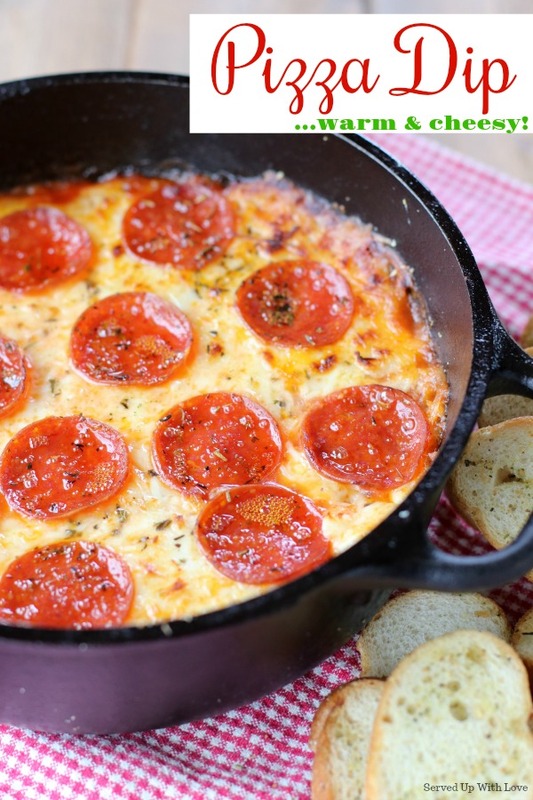 Two words, Pizza Dip! This warm and cheesy dip is an easy recipe to make anytime you have guests over. Your guests are going to rave over this dip. In our family, pizza is life. I mean seriously! If you ask my kids or my husband what they want, the first thing that comes out of their mouth is pizza! Since we like it in everything we eat, why not in a dip! This dip starts of with a cream cheese layer that is filled with cheese and Italian seasonings. Dipping into that layer gives this dip that wow factor. Smack dab in the middle is a layer of pizza sauce. This Homemade Pizza Sauce is so easy to make and its one of our favorites. That gets topped with mozzarella and Parmesan cheeses. 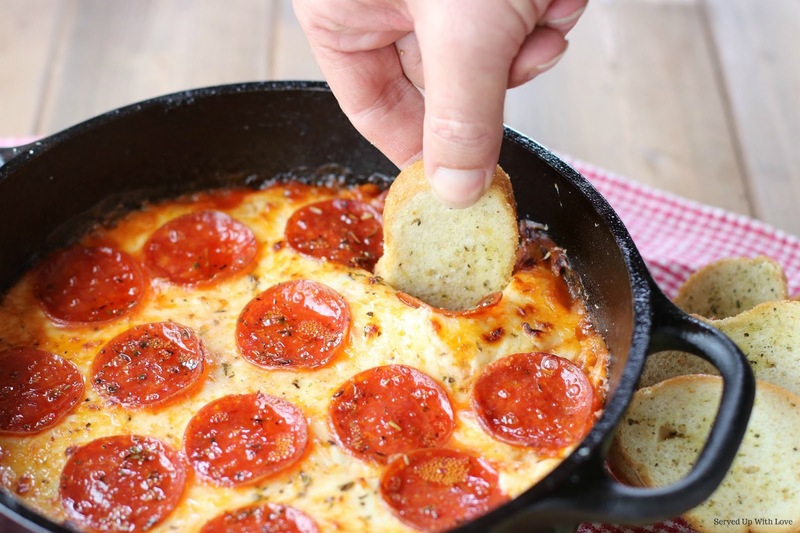 And finally those pepperoni slices finish off this dip. Bake it in the oven until hot and bubbly and the cheese is golden. Don’t stop with just pepperoni, get creative with the toppings! Add sausage, peppers, onions, mushrooms, or ham. Any or all of these would all be delicious in this dip! Serve it up with some Garlic Bread Toast, Buttery Garlic Bread Chips, Garlic Bread, or grab a baguette at the store, slice it, and toast it. 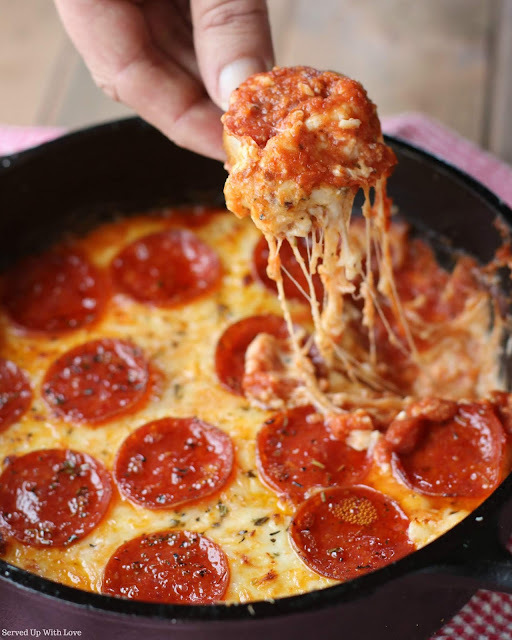 This Pizza Dip is a great twist on your favorite pizza! 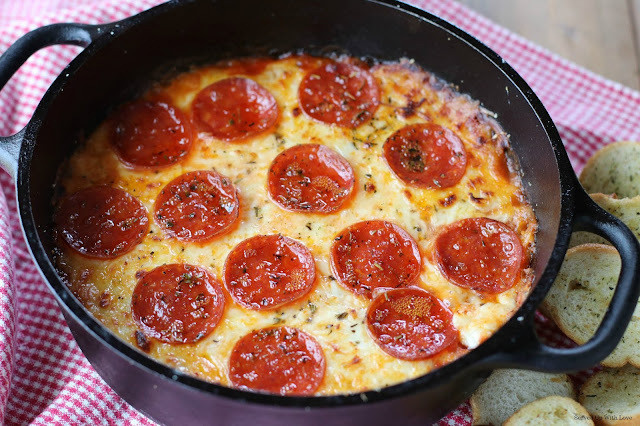 All of your favorite pizza ingredients get baked up golden brown in this delicious warm and cheesy dip. 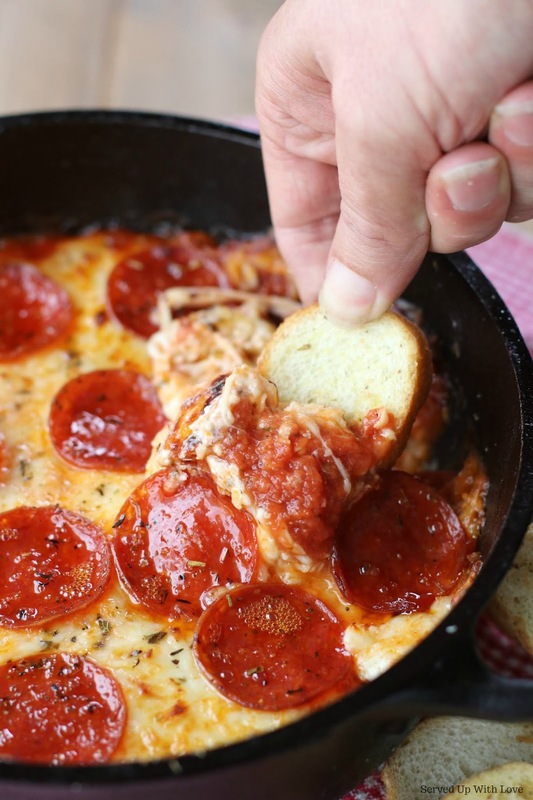 Warm and cheesy Pizza Dip is the dip everyone is going to rave over. Its an easy recipe to make for any party or tailgate. Preheat oven to 350 degrees. Mix cream cheese, oregano, Italian seasoning, basil, cheddar cheese, pepperoni slices, and 1 cup mozzarella cheese. Spread the cheese mixture into a cast iron or casserole dish. Pour the pizza sauce on top of the cheese mixture. Sprinkle the top with the remaining cheeses with more pepperoni. Serve with toasted baguette slices, pita chips, or tortilla chips.